The military doctrine of ‘command and control’ heavily influenced the structural approach to management characterised as ‘Scientific Management’ and the works of Taylor (1911). Scientific management assumes, amongst other things, that ‘supervision must be achieved through a clear chain of command and through the application of impersonal rules’ and that ‘only those at the top have the capacity and opportunity to direct the enterprise’. This philosophy has strongly influenced the development of project management (see: The Origins of Modern Project Management). But does this represent effective military management? Following the defeat of the Prussian armies by Napoleon at the battles of Jena and Auerstedt in 1806, the concept of ridged process-oriented command and control structures has been progressively replaced by the concept of ‘auftragstaktik’, or directive command. These ideas were originally championed by Major General Gerhard von Scharnhorst and were formalised by German Generalfeldmarschall Helmuth von Moltke who was the chief of staff of the Prussian Army for thirty years from 1857. The core concept of auftragstaktik is ‘bounded initiative’. Provided people within the organisation hierarchy have proper training and the organisational culture is strong, the leader’s role is to clearly outline his/her intentions and rationale. Once this is understood, subordinate personnel can formulate their own plan of action for the tasks they are allocated and design appropriate responses to achieve the objectives based on their understanding of the actual situation, exploit opportunities and mitigate problems. his understanding of his commander and his peers. These latter aspects are captured in the notion of ‘implicit intent’, would provide him with the basis for his course of action and bound the solution space available to him. A General may wish to defend a city, a Brigade Commander defend his designated sector and within the sector, a Platoon Commander may be tasked with establishing a road block which involves one of his NCOs establishing a strongpoint. The General does not need to instruct the NCO on how to site the strong point, camouflage it or man it. At each level, good leaders will think ‘two levels up’ and provide oversight ‘one level down’. The process is not random, Standard Operating Procedures (SOP) define how specific tasks should be accomplished and ‘bounded initiative’ allows the individual leader to optimise the SOP for the specific circumstances he or she encounters to best support the overall intent of the commander. Von Moltke emphasised that he wanted to ‘steer’ initiative in the right direction. These concepts are closely aligned with the human resources approach to management, which developed in the 1950s and 60s and emphasise a symbiotic relationship between individuals and organisations where ‘democratic leadership is the most effective means of managing’ and ‘openness and participation are the most effective means of demonstrating democratic leadership’. On very small projects, a project manager may be capable of directing and controlling the work of everyone in the team. However, as soon as the team or the technology grows beyond a relatively simple system direct ‘command and control’ becomes impossible and attempting to impose a ridged hierarchy based on formal instructions will lead to inefficiencies. Effective leaders need to establish clear guidelines and a system of protocols, chain of command, and standard operating procedures so that everyone in the project team knows what they to do and who is accountable. The overall action of the team is unified by the leader’s intent; within this space sub-teams and smaller work groups are allocated their individual missions and tasks within that higher intent. Once this framework is in place, properly trained team members can go straight into the performing stage of their activity. This alternative to ‘command and control’ developed by the Prussian military in the 1860s allows a far more effective and efficient use of resources. Auftragstaktik is not an easy option, the team needs better leadership, better training and the willingness to engage in taking ‘bounded initiatives’ but overall it offers a much better way of achieving the project’s objectives. Applying these concepts does not reduce the importance of the normal project management artefacts such as the schedule and cost plan; what changes is the way these artefacts are used. In a decentralised management structure, the Project Plan defines the guidelines and framework the team will work within rather than attempting to prescribe how they will work (for more on this see: Project Controls in the C21 – What works / What’s fiction). This is the end of a busy week in Rio de Janeiro working with the ISO PC236 committee drafting ISO21500 – Guide to Project Management. My particular area of interest is terminology and one of the more interesting debates was around what’s produced and created by a project. The Dutch delegation started the ball rolling with a very well thought out proposal, this is my personal views on what makes sense at the end of a long week discussing this and a wide range of other comments and issues on the standard. The first line of discussion was around the creation of the projects ‘outputs’, both deliverables and project management outputs. Outputs are created by a process. Most outputs are inputs to other processes; many project management outputs are used within the project to manage the work. Deliverables are the final outputs that are transferred to a third party outside of the project, usually either the customer or the performing organisation. Goals linked to the project achieving is stated objectives. Objectives that are achieved by undertaking the project work in an appropriate way. These include objectives such as safety, sustainability, workforce development and stakeholder management. Objectives that are achieved as a consequence of successfully completing the project, the deliverables. These include enhancements to the Organisational Process Assets (OPA) of the performing organisation and the assets transferred to the customer. The successful delivery of ‘deliverables’ includes achieving technical requirements such as time, cost and scope; plus stakeholder requirements such as value and usefulness (see more on stakeholder management). Whilst benefits realisation it is usually outside of the objectives that can reasonably be assigned to the Project Manager, the project team are responsible for making sure what they deliver is what is needed to facilitate the organisation (or client) in achieving the overall goals the work of the project is central to achieving; see: Avoiding the Successful Failure!. The question is, does this structure work in for you? Your comments will be appreciated. This is just a short post to clear my mind of some converging thoughts. The first background element is the announcement this week that the UK government has slashed its school building program (although the new government is still likely to do more then the old); and finding a place in an Australian University is a difficult as ever. The second element is a couple of radio features discussing the evolution of mankind in particular the key point some 100,000 years ago when our ancestors developed trade and probably saved themselves from extinction. Followed by the development of agriculture some 10,000 years ago followed by cities that allowed the time for arts and science to flourish. Arguably, the shift from low density, low interactive populations of hunter gatherers to the relatively high density, high interactive communities of the late Stone Age and Early Bronze Age facilitated the emergence of early civilisations in the Middle East, Indus Valley and Central America some 3 to 4,000 years ago. The third element is a book on ‘The Lunar Men’ a group of natural philosophers, scientists and business men that largely kick started the industrial revolution in the UK Midlands (Birmingham) in the 18th Century. This group were the last of the European ‘renascence’ which itself was based on the ability to communicate effectively assisted by the development of printing and inter European communication. All of these leaps in knowledge were based on the ability to interact and communicate in a more effective way than was previously possible. The supporting elements are improvements in trade and commerce and the ability (in latter times) to overcome entrenched opposition to new ideas. A modern example of this phenomenon is Silicone Valley and the massive leap in the way the world interacts caused by the development of the Personal Computer. Waves of innovation seem to be partially serendipity, you need the right people and the right ideas, but this is helped by the quality, density and flexibility of the communication network between them. Discussion, argument, collaboration and competition in an environment that allows multiple independent threads to develop concurrently seems to be the catalyst for literally changing the world. Based on this construct, my prediction is the next massive wave of innovation is likely to come out of China. The one statistic that for me sums up where China is going is the 60 million qualified university graduates that enter the workforce each year. Many of China’s Universities are world class and the concept of an annual intake of new graduates entering the workforce that is three times the total population of Australia speaks volumes for the skills, innovative capability and sheer energy being generated in this vast economy. The region I visited was the Yangtze River Delta. This region has always been a major industrial centre and the emergence of Shanghai as the economic capital of China has simply accelerated its development and expansion. Today, this part of China has double the foreign trade of the entire Indian economy and represents 25% of China’s GDP. The China I saw actively encourages innovation and technical development, has effective communication and a very large talent pool. All that is needed is a little serendipity and who knows what may be developed. In the same way efficient steam engines created the industrial revolution (Watt and Boulton were both Lunar Men) and the PC created the knowledge revolution anything may be possible (and predicting the outcome in advance is nearly impossible). There are alternatives – the internet allows everyone to communicate so location is no longer a central issue to collaboration; and the major limitation on the Renascence was the entrenched interests of the Church and secular authorities. However, overall I feel the next major wave of innovation cannot be far away what it looks like and where it starts are open questions but slashing access to quality education and limiting the desire to learn certainly won’t help the UK or Australia be in the forefront. On a smaller scale, every organisation can help its people innovate by creating the right environment for ideas to emerge. One of the interesting juxtapositions around Expo 2010 is its theme of sustainability contrasted to a massive temporary exhibition focused on an intensive 6 months with much of the site to be demolished in October. The Expo is certainly a success with a projected attendance of 75million visitors. From the sustainability perspective there have been many innovations and initiatives. Much of the heating and cooling uses heat pumps powered by solar (PVC) cells. Movement across the site has been optimised in three planes, above on, and below ground encouraging walking and most of the transportation is electric powered. Several of the larger buildings are designed for re-use and one incorporates the world’s largest green wall. Another innovation has been refurbishing many of the pre-existing industrial buildings on-site to preserve Shanghai’s heritage. The Expo is also hosting a string of conference events focusing world experts on its theme of ‘better city, better life’ and sustainability. This was also a key focus of the CIOB events we attended. 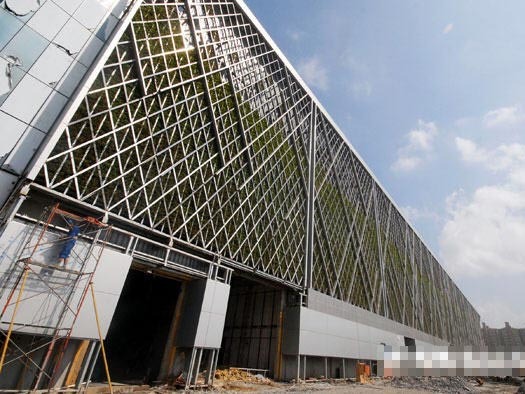 The World's Largest 'Greenwall' diring construction. Now it's a mass of green. Part way through, it’s hard to assess if the Expo will contribute a net benefit to sustainability and ‘better city’ development but from what we saw, it is looking positive. Before moving onto other topics though, there were many pavilions that really caught our attention. The Chinese and UK pavilions have already been mentioned. 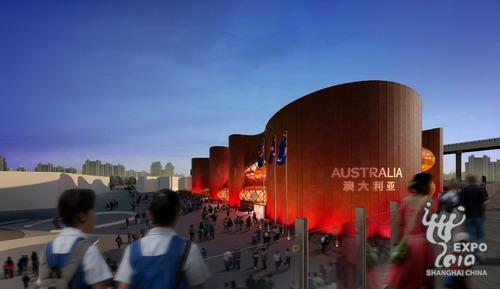 The Australian pavilion is a standout design looking like cross between Ayres Rock and a tin shed. The design is very distinctive and ‘Australian’. Many of the countries used interesting cladding to focus on sustainability and insulation. The Canadian pavilion was covered in lumber, the Portuguese in cork. The ‘paper cut’ effect of the Polish pavilion combined a classic Chinese art from with shading and ventilation. Overall the experience was fantastic, as long as you don’t mind the crowds, and will be long remembered. Thoughts on sustainability and ‘Zero Carbon’ will follow in later posts. The Chartered Institute of Building for the first time in its 187 year history held its AGM, Board of Trustees and Members Forum meetings outside of the UK. In addition to the working meetings, the two highlights of a busy week were the International Construction Conference focused on sustainability and ‘zero carbon’ construction and a visit to World Expo 2010. The business part of the week was centred in the impressive J.W. Marriott hotel and the adjacent Grand State Theatre. Given some time to reflect on these experiences, I intend writing a couple of posts focusing on some of the ideas and observations from the meetings and conference. I want to focus this post on an incredible experience from World Expo. 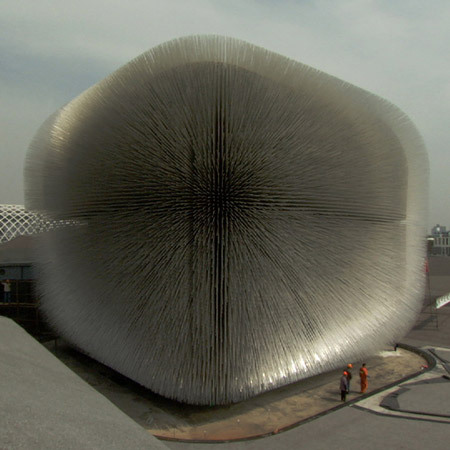 Lynda has described the size and intensity of the Expo in her post World Expo Shanghai 2010. And whilst the China Pavilion undoubtedly had the longest queues, another ‘long queue’ pavilion is the remarkable British ‘dandelion’. 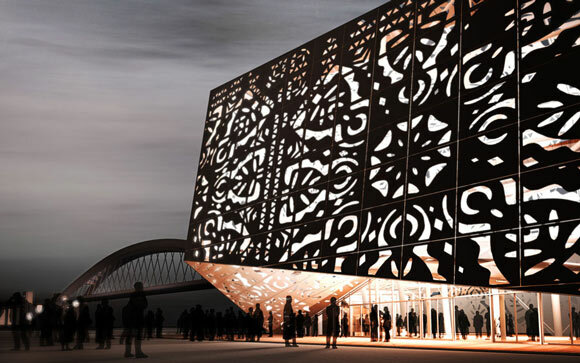 The design concept is that of a ‘gift’ to the Chinese people surrounded by its wrapping paper. 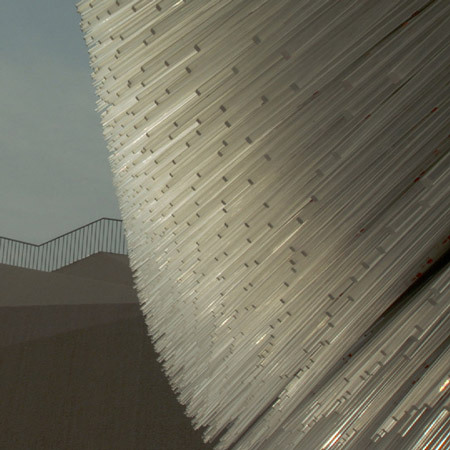 The wonderful fuzzy effect on the outside is created by 60,686 hand crafted acrylic rods, each 7 meters long which allow light into the inside of a 20 meter plywood cube. 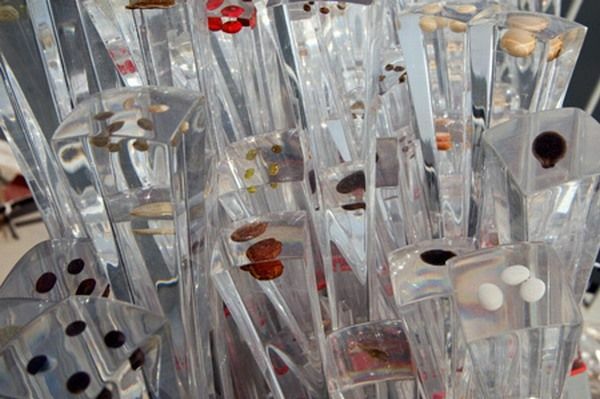 Remarkably each rod has between 1 and 10 seeds embedded in the end representing Chinese plant species that are growing in the UK. The effect outside is fascinating, inside it is simply mind blowing. I have never experienced anything quite like this. At one level the display is totally useless, at another the juxtaposition of 60,686 individually hand crafted rods focusing on plant seeds to the overall scale of the Expo simply has to be experienced. Judging from the fact over 1 million people a month are queuing for hours for the experience, I feel the UK designers have achieved their objective of raising the UK’s profile at all levels of Chinese society. At the moment, plans are to demolish the pavilion in October and to distribute the section of each rod holding the seeds to schools and other institutions. I hope this changes and the ‘cube’ can be found a home intact somewhere in the city for future generations to experience. I have just finished a week in Shanghai; the main purpose of my trip was to participate in a panel session at the CIOB International Construction Conference. For more on this see Patrick’s post CIOB Shanghai Meetings. However, the highlight of the trip was a day spent at World Expo. The Expo is simply enormous. The site covers a total area of 5.28 square kilometres spread along both sides of the Huangpu River in downtown Shanghai; it includes gardens, wet lands, paved walkways and 100s of new and renovated buildings. In the two months since opening the Expo has hosted over 20 million visitors and expects over 75 million before closing in October. On busy days over half a million visitors are on the site. Everywhere you look on the site there are queues but the organisers keep things moving, the officials are polite and helpful and the crowd rubs along without friction, maybe even enjoying the experience. From a stakeholder management perspective, expectations are managed and information is readily available, particularly if you speak Mandarin – international visitors are not likely to exceed 5 million. The China Pavilion dominates the site and is a wonderful experience. For locals to visit the pavilion, someone has to join the queue outside the gates at 6:00am to so when the gates open at 9:00am they can be near enough to the front of the next queue at the China Pavilion to receive some of the 50,000 tickets issued daily to allow them join another queue for 2 to 3 hours to get inside to see and experience the exhibits. I was more fortunate, the hosts of the CIOB conference were able to arrange VIP access but I can understand why the Chinese pavilion is worth the wait. Its exhibits really are wonderful. There are over 200 countries and international organisations represented, ranging from Tuvalu to the USA; the World bank to the International Council of Museums, as well as numerous major corporations and most Chinese provinces. Almost every pavilion had its queue! In a long day I only managed to see a small section of the total experience but could start to appreciate the overarching purpose of this great festival. My visit to the Expo was a once in a lifetime experience. If you can’t make the trip personally, you can be a virtual tourist on line at http://en.expo.cn/. Either way World Expo 2010 is well worth the visit.